YORKTOWN, New York (WABC) -- Democrats in Westchester County are condemning a campaign flyer that was mailed to voters in Yorktown last week. Reginald LaFayette, head of the county Democratic Committee, said the imagery and text are full of racial overtones meant to create fear. 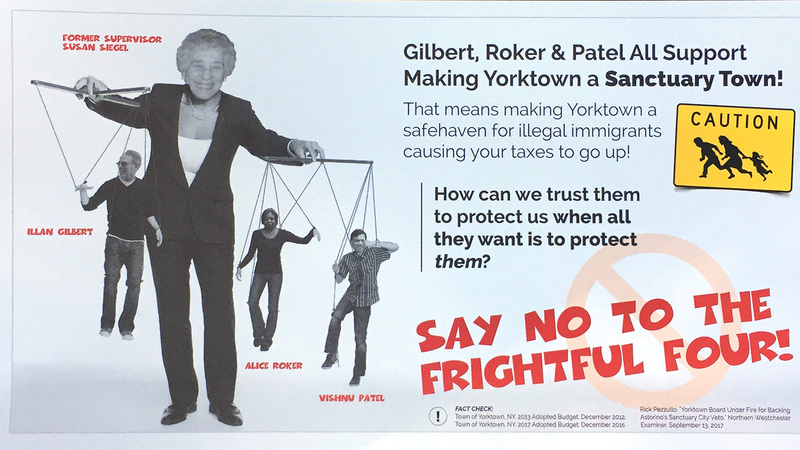 The flyer depicts former Town Supervisor Susan Siegel, a Jewish woman, as a puppeteer controlling three Democratic candidates that include an African-American woman and a man of Indian descent. The ad refers to the group as "The Frightful Four" and claims they will make Yorktown "a safe haven for illegal immigrants causing your taxes to go up!" The back of the flyer displays a picture of the five Republican candidates describing them as "standing up for taxpayers...Never taking a knee!" The line is an apparent reference to the recent protests by NFL players against racial inequality. Current Town Supervisor Michael Grace says any racial implication is a "gross stretch" and likens the Democrats' reaction to "a hammer looking for a nail." The ad was paid for by the New York Republican State Committee.